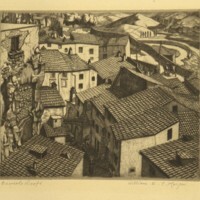 Engraving by William E. C. Morgan entitled "Orvieto Roofs". 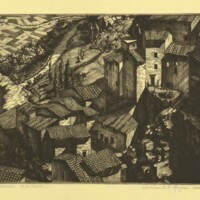 The image depicts stone houses and a winding road. 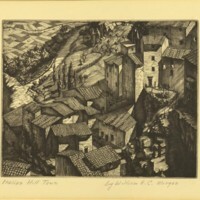 Engraving by William E. C. Morgan entitled "Italian Hill Town". 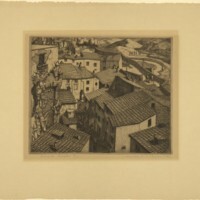 The image depicts small houses overlooking a street and farmland. At the bottom of the piece the artist has signed the piece and written, "Final State, TRIAL PROOF". Original ink woodcut print untitled. 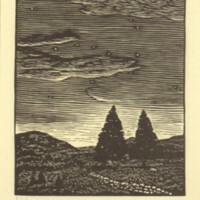 Piece depicts nightfall over a meadow. Original ink woodcut print untitled. 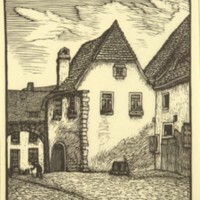 Piece depicts a quiet street scene. 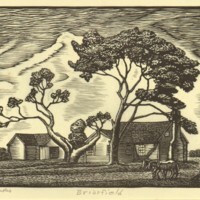 Original ink woodcut print titled "Briarfield". 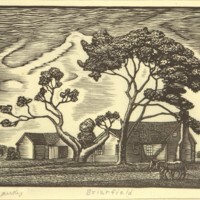 Piece depicts a small house and barn under a large tree. There is a man plowing his fields with two horses. 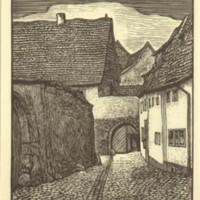 Original ink woodcut print titled "Klostergasse". 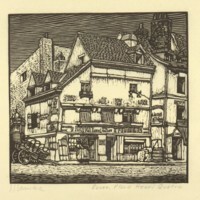 the piece depicts a street scene with a small man bending over his cane.